The thin chill of the late fall day cut through his clothing. He looked around him, at the bare gnarled branches of the trees that curled and twisted against the pale sky. Students, hurrying across the campus to their classes, brushed against him; he heard the mutter of their voices and the click of their heels upon the stone paths, and saw their faces, flushed by the cold, bent downward against a slight breeze. He looked at them curiously, as if he had not seen them before, and felt very distant from them and very close to them. He held the feeling to him as he hurried to his next class, and held it through the lecture by his professor in soil chemistry, against the droning voice that recited things to be written in notebooks and remembered by a process of drudgery that even now was becoming unfamiliar to him. Implicit in this (and perhaps throughout Stoner, though here again the vagueness of its treatment makes me uncertain) is an idea of literature that is at once elevating and profoundly anti-intellectual (there’s no mention of any analysis of the sonnet, any contexts provided for it, not even any commentary on its formal elements). The introduction to this edition quotes Williams objecting, in a “rare” interview, to the idea that “a novel or poem is something to be studied or understood rather than experienced,” but there’s no reason why these must be antagonistic approaches, and in his sympathetic portrayal of Stoner, who does, after all, dedicate himself to studying and teaching literature, Williams does not seem to rule out the possibility that analysis can further the “joy” he claims in the interview is the purpose of reading. Through Stoner’s relationship with Katherine Driscoll late in the novel, we are told that Stoner reconciles “the life of the mind and the life of the senses,” after having come to believe, “without ever having really thought about it, that one had to be chosen at some expense of the other.” This discovery motivates and enhances Stoner’s research as well as his teaching–but we have had only the most impressionistic sense of his work before this: this emphasis on a conflict between head and heart comes upon the novel somewhat belatedly, I think, and thus does not stand as an overall gloss on the novel’s presentation of academic life. So I have not read Stoner. The funny thing, though, is that the Western Williams wrote, Butcher’s Crossing is explicitly about a guy who wants to experience Nature without studying or understanding it. He succeeds, but the experience is destructive – it effaces his personality, his past. The kid is not unlike Stoner in that passage about his reaction to the poem. That novel seemed to me like a critique of experience-first Romanticism. 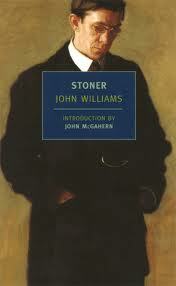 This past year I purchased several NYRBs and Stoner was one of them, selecting it pretty much for the academic theme. I haven’t read it yet but was so interested in your take on it. Anxious to try it for myself. The passages you quoted have a real sort of Penguin-classic nineteenth-century novel vibe–as if he’s trying to create a book that signifies “great literature” and evokes, through its novelistic idiom, the feeling of excitement many of us had as teenagers, when we first discovered the power of literature, in a very intuitive and non-analytical way. Ironic that these are the sort of feelings that lead many of us eventually to become dispassionate critics who eventually regard the notion of Literature with skepticism and look at this sort of passage, not with hushed reverence, but with the thought: what’s with the archaic style? When, after all, was the last time I felt “languor”? That’s an interesting comparison to Butcher’s Crossing, Tom. I can’t quite work out whether Stoner reverses that critique or means to reiterate it in some way. I’ll be curious to know what you think of Stoner, Diane. It’s certainly very readable–and thought-provoking. I feel “languor” all the time, Ted! Well, actually, I guess that’s just fatigue. You raise the possibility that there is something almost elaborately meta-fictional going on with the style of the book–or at least something aspirational, in terms of seeking out a highly “literary” idiom.